If you are considering travel hacking, whether you are looking to become long-term, hard-core travel hackers or if you are the kind of person that is like “Yeah, I could go for one trip of a lifetime!” you are most likely facing an upcoming credit card application in order to earn points and miles to exchange for a free flight or hotel stay. Some people open one card, earn their points, take their one trip and forever look back on that experience as a once in a lifetime opportunity. Other people get addicted to travel and crave more and more experiences around the world, which means needing more resources to afford the flights and accommodations. These people, like Andy and myself, can either pay (who can afford all that!?) or continue to open more and more credit cards for more and more free travel! It doesn’t matter which side of the boat you are sitting in because most likely, you are going to need to go through the exact same starting steps and processes regardless of if you want one or 60 cards. Whether you have a stack of cards in a drawer or just one that you’ll continue to use over time, you’ll face the same questions and concerns over time. That’s what we are going to walk you through today. You all hear me gush (ok, more times make fun of jest) about my hubster, Andy. He is the brains behind all our travel hacking. He was the one that suggested we start opening credit cards for free travel (and I firmly said, HELL NO, you aren’t wrecking my score!!! But more on that later). He is the one that used to spend hours reading blog after blog and learning everything there is to know about travel hacking. He’s the one that created the FlyerMiler tool. He is also the one that manages all our credit cards, from figuring out which ones to get first or next, to tracking when bills are due to knowing when and what cards to cancel. So, today, we sit down for a chat with the expert. While I talk about Andy all the time, today we bring him on board for a case study interview. How and Why did you decide to start travel hacking? I’m not entirely sure how I first stumbled across the idea of travel hacking. I read tons of blogs about unconventional, frugal and minamalist living, which I’m sure eventually led me to Chris Guillebue’s blog. Since LeAnna and I loved to travel, I knew that travel hacking could be the financial secret to making it possible. I bought his “Upgrade Your Bucket List” book which got me started. After convincing LeAnna that using credit cards for sign up bonuses and points wasn’t going to wreck our scores (and after it paid for our first flight back to the US (from Germany) for LeAnna’s sister’s wedding, and then again in just a few short months after back to the US for another friend’s wedding) she was pretty sold- she can’t argue with free. Most people can’t afford to travel internationally “just because” and yet we were doing it several times a year on points for various events from weddings to holidays to family functions. How did you decide what card to first open for points? After learning about how to travel hack and that the absolute biggest key to travel hacking is sign up bonuses, the first card(s) I decided to go for were ones with extremely high sign up bonuses. At the time (2011) you could apply for several cards with the same bank on the same day and they would only do one hard credit inquiry. When I was ready to start, there was a limited time offer with a huge sign up bonus with the Citi American Express and Citi Visa cards at a whopping 75,000 points per card. Because of the great sign up bonus, this was one of the main reasons that I started with these particular cards. You said you went with high sign up bonuses. How did you know that they were good cards or a good amount of points? 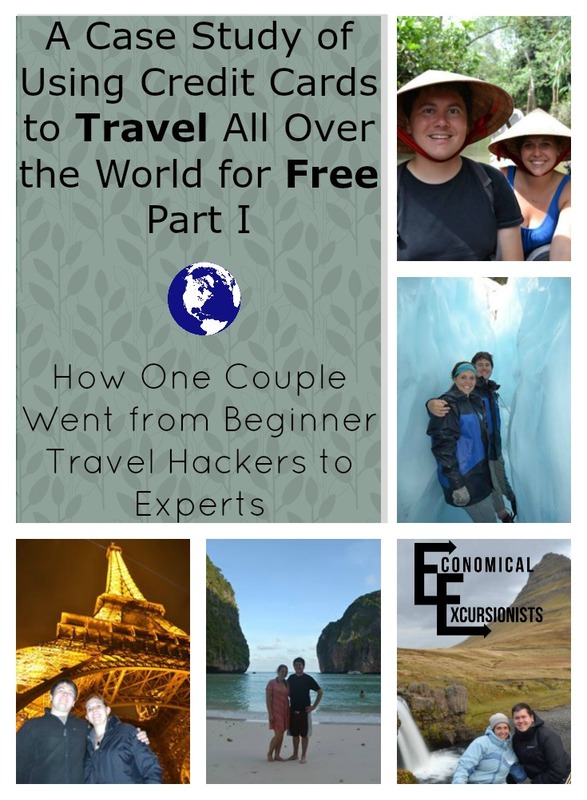 – Is it highly recommended by other experts in travel hacking (I often refer to Chris Guillebeu, Viewfromthewing and sometimes the FlyerTalk forums to see what the chatter is in the travel hacking world and what the “pros” are recommending). – Is there a good sign up bonus (I know the bonus is good if it is a high number of points, if the points are in a valuable currency, such as AA or United) Just because a card offers a ton of points, doesn’t mean that they are valuable or easy to use and redeem. You said you opened two cards at the same time? Is this typical? Actually, we opened up four cards at the time. Two in my name and two in LeAnna’s. We knew that the sign up bonus offer of 75k was rare and that we had to jump on it while we could. In the first few years when we were building up our accounts, we would typically apply for at least 1-2 cards every three months, give or take. As a couple, I would often apply for the best cards available then in three months, LeAnna would get the same cards. This way, we were only individually applying for credit cards (and getting hard inquiries) on average every 6 months. Now that we have gotten most of the main cards, we might only apply for one card at a time every 3-6 months. I would say that this is typical for people who can manage their spending and are wanting to become expert travel hackers who travel frequently. 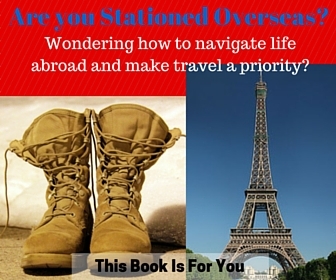 However, not everyone has those same travel goals, so others might only open one or two cards total and be done. Weren’t you afraid you wouldn’t meet the minimum spend with FOUR cards opened at the same time? In order to travel hack, you HAVE to be financially aware. You never open a credit card that you can’t meet the minimum spend on and you absolutely NEVER charge more than what money you physically have in the bank and could pay off today if you had to. -At the time, my work was paying for my grad school. These were HUGE expenses. Basically, I could charge my tuition and have the minimum spend met immediately. My work would then reimburse me for the tuition and books (that I just charged) so technically, I never really “spent” that money myself, yet reaped all the rewards and points! – We were also building a backyard patio at the time. Many people who travel hack will open a card when they know they have a big project coming up so that they can quickly meet the minimum spends. Again, we had the money in the bank, this was not money we were just charging to build a new patio. However, it was a win-win. We spent the money we were going to spend anyway on the construction and earned enough points for free flights while doing so. – Also at the time were Amazon Payments. I could “pay” LeAnna up to $1,000 a month and she could do the same. Therefore, if we ever were close to not meeting the minimum spending limit, this would usually top us off and the best part was again, we weren’t actually “spending” any money since we were just transferring it back and forth between us! Sadly, Amazon Payments no longer exists. After you chose your initial cards to start with, how did you decide what cards to go with next and how many? Since we had just opened 4 credit cards between the two of us, I actually waited almost a whole year before I did my next “round.” Again, since you could apply for several cards with the same bank on the same day for only one hard inquiry, I looked for cards that I could do this with. Since this option no longer exists, I typically wait around three months and then start researching what the best cards are out at the time. So, I start looking for higher than normal sign up bonuses with a valuable points currency first and foremost. So you never get a card based on a travel goal? This is what most of the experts recommend. You pick a travel goal, figure out what points will get you there and then collect those points. However, I actually went against this and just simply went off of the best sign up bonuses and cards at the time. This actually benefited us greatly overtime. Instead of having points with just a few major airlines or programs, we were able to collect across the board pretty equally. What this meant was that whenever we were ready for another trip, we weren’t locked into a certain airline and it opened up way more routing and availability options. If I knew that a card went up and down with their sign up bonuses, I would typically wait on that card until it was a better and higher sign up bonus. And you never got a cards with just one loyalty or rewards program? 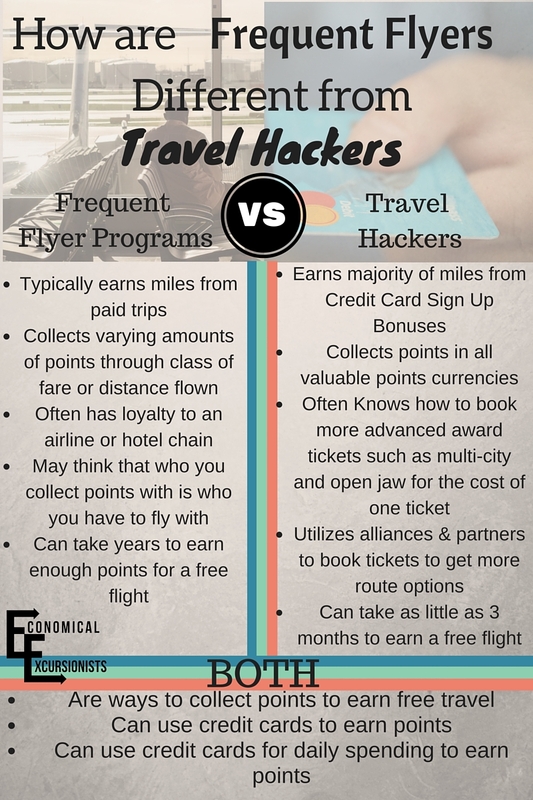 This is often the difference between what most people think of when they think of a “Frequent Flyer Program” and travel hacking. With your average loyalty programs, you might sign up for ONE credit card with an airline that you typically fly and then continue to painfully and slowly build up points with them as you infrequently pay for flights or hotels with that brand. Not sure everyone understands the difference? Pin as a reminder! However, with travel hacking, I, and most others, don’t want to be locked into one brand so that we have way more flexibility. With that being said, I do tend to stick to the cards that have the most valuable currencies, so cards that earn me American Airlines and United miles. These are my two main currencies because they both have so many partner airlines that you can use them on. So no, I do not have a “loyalty” towards any one program, just who can get me the most free travel! Are you a travel hacker? How did you first get started? Very detailed advice, thanks! I always wonder if travel hacking is possible when you have a nationality of a European country (like I do). Do you have any advice for me? I’m slowly starting the process of travel hacking, but I’m scared I’ll wreck my credit if I have a low financial month haha. Do you find it easier to do it as a couple as opposed to as an individual? Hey Carly! Make sure you read my myths and misconceptions post about scores and C.C. You’ll find it very helpful! https://www.facebook.com/groups/TTG4L90/ As far as couple vs individual, it is basically just the same, just we duplicate the process for the 2nd person. In fact, it might be harder as a couple bc that means you have to meet the minimum spend twice, double the tracking for bills, etc! I really have to start diggind into travel hacking and travel credit cards a bit more. They seem like such a good way to save money on traveling. However, as I’m still a student without a regular income I don’t want to get a credit card just now. But once I finished uni, I might. Hey Kathrin, did you read the section on using your C.C to pay for school? You are already paying for it anyway (so it is not $ that you are spending extra). Basically, you already have that money in your account for school, so you pay the bills w/ your card and then just pay off the card (IMMEDIATELY) w/ the money you already had. BAM…free trip within months…just for going to school! Using big projects to earn your minimum is a great idea! What a smart way to further utilise the amount you were already paying for education. Also really liked the question and answer format of this post, felt a lot more doable and friendly- like someone teaching you! Great post and really great information. I wish NZ had some of the credit card perks like the US and the UK. Maybe one day us Kiwis can join in too with all this free travel! I think the key in all of this is being willing to do your research. Grab a bottle of wine, settle in for the night, and find the program that’s right for you. Haha!!! A woman of my own kind. Is doing ANY kind of research actually possible without wine??? Doubtful. Where in Europe are you? I know the UK has a few (not many) programs and options. We are currently living in Germany and I will say that at least in the last 5-10 years, credit cards have become MUCH more accessible and used so hopefully it’s just a matter of time before similar programs take off here as well! how I wish this is also applicable for Philippine passport holders. I need to learn more travel hacking tips. Thanks for sharing this post! Carla, I wish I could say I knew more about international travel hacking I know that the US has the most opportunities, but that doesn’t mean that there might not be something for you that could at least get you a little something? Might be worth a quick google search, if nothing else! Pingback: We've Got an Announcement....!